Brewer Johnathan Wakefield quickly exceeded his goal when he launched a crowdfunding campaign to raise start-up money for his J Wakefield Brewing. Johnathan Wakefield put his virtual pencil cup out not on some high trafficked thoroughfare—let’s call it Kickstarter Blvd—but on the internet equivalent of a dark back alley—we’ll call it Crowdbrewed Lane—with the mission of raising $55,000 to help finance J Wakefield Brewing in Miami where, let’s be real, they really need some more breweries. Wakefield chose to run his campaign for 45 days, and even though Tom Petty says the waiting is the hardest part, in a mere two days, the hop-hobo’s wish was granted. In fact, his shaker pint overfloweth and beer-loving denizens of the world wide web contributed over $110,710, a staggering 201 percent of his ask, to fund Wakefield’s dream. It used to sound odd that entrepreneurs would seek financing from John and Jane Q. Public for breweries at which the profits will only benefit the prospective owner. But in a country where billionaire sports franchise owners are routinely awarded millions of taxpayer dollars for sporting stadia (lest said owners take their teams to a different market whose citizens agree to foot the bill for the arenas), perhaps we’ve grown accustomed to ponying up out of pocket where, yes, the proceeds go into the businessperson’s pocket, but the project is viewed as benefiting the public good. And what does the public more good than breweries?! There used to be really only one or two ways to kick start your own brewery: begin incredibly wealthy (or have super rich parents, uncles, etc. ), or take out a terrifying business loan. Now, aspiring brewers are holding something of an online bake sale, minus actually selling any cupcakes and in fact, since nearly all are startups, donors haven’t even sampled their beer to see if it’s any good. Instead of standing on the corner with a lemonade stand to raise some capital, web-savvy entrepreneurs are creating pages on Kickstarter.com and IndieGoGo.com, the top two crowdfunding sites for creative projects. Not surprisingly, tech realm projects are the top dollar generators across crowdfunding platforms; 38 surpassed seven figures in 2013. Many projects are documentaries like the one about the choreography of trash collectors in Austin, some truly off the deep end like installing a floating pool in New York’s East River. But what’s more creative than making beer? Justin Kazmark, Kickstarter director of communications, said the company receives thousands of submissions weekly, of which about 60 percent of the proposals are accepted and they never make aesthetic judgments. “It’s not like we say to a music project, ‘Lose the bassist’ or ‘Tweak the plot’” to auteurs or, for that matter, rethink their choice of brewmaster or city to open their brewery. Alas, no one at Kickstarter or CrowdBrewed gets to sample entrepreneurs’ homebrew first. CrowdBrewed.com, the website Wakefield elected to beta, is new from Trevor Benoit and Mark Slattery, the Denver Beer Guy who turned to, yikes, Kickstarter to fund a 15-month, 200-brewery cross-country beer trip. In his defense there was no CrowdBrewed at that time. Man, I wish this was a concept the first time I traversed the country visiting breweries! Kazmark added that some 45 percent of the projects meet or exceed their fundraising goals and noticed that projects that initially reach 30 percent of their ask eventually get funded 90 percent of the time. So if your goal is $20,000 and no matter how many times you hit refresh on your project page it shows microphilanthropists have pledged $6,650, don’t order those stainless tanks just yet. Benoit, however, pointed out, “As for failure versus success for breweries…crowdfunding campaigns have a 33 percent success rate across all platforms. The difference is, others are able to bury the failures under many layers of non-related campaigns.” I should note that CrowdBrewed, still in its infancy, has only launched a total of 10 projects, seven of which are actual brewing companies of various size, and of those three such campaigns are still ongoing. Of the original four brewery projects, Pigskin from Ohio barely topped its funding request of $15,000 by an Andrew Jackson. Even more eyebrow raising, Denver’s Triumph pulled in precisely the $6,110 it sought. JWB we already know was a raving triumph, making it the single-most successful brewery project on any platform thus far. But then there’s San Diego’s Orbit, which failed to raise even the minimum $500 on CrowdBrewed (and same for its IndieGogo project), yet founder Rebekah Mort’s same project on Kickstarter shot for $2,500 and hit $2,501. Here it’s worth mentioning that campaigns on Kickstarter and CrowdBrewed are all-or-nothing whereas IndieGogo shells over anything the campaign raised, even the 25 bucks Orbit raked in there. Not that Mort saw all 25. You see, over the last four years, more than 100 aspiring professional brewers have spare-changed for brewery bucks. When deep-pocketed or shallow-sofa-cushioned Web surfers pledge donations, their credit cards only debit if the project reaches its funding goal on Kickstarter and CrowdBrewed (that keep 5 percent for themselves). If someone reaches $24,999 of their $25,000 goal, no one—neither the brewery nor the host website—sees a penny. By contrast, the primary difference on IndieGoGo is that however much the creator raises, the creator gets (minus 4 percent if completed or double for those that come up short; likewise, CrowdBrewed more recently added a “flexible funding” option where they’d take 8 percent of any funds raised even if less than the full amount). To help get funded, those launching projects offer premiums. Five bucks might get you a sticker. A grand might score you your own eponymous tank or a beer named after your pet. The best part of these crowdfunding projects may be the five-minute videos each commercial brewery hopeful posts on their page. Caveat brewer—just because you run a successful campaign doesn’t mean your brewing dreams won’t cost you a penny. Half of all that scratch Mystery raised quickly went to a graphic designer. That people happily donate their own hard-earned cash to new breweries in craft beer rich regions such as Oregon and North Carolina might seem counterintuitive except that it demonstrates the depths to which locals truly go to support their brewing community. (Raleigh’s Crank Arm Brewing and San Diego’s Plan 9 Alehouse each generated more than $42,000 in goodwill.) However, it’s more vital when online platforms are employed to help brewers where they’re needed most. Even more than Los Angeles, Lucky Town Brewing Co. in Jackson, MS, made this point a central tenet of its plea and got more than $22,000 (having asked for an even twenty), becoming the Magnolia State’s third brewery. Lucky Town’s four founders used the Kickstarter funds to purchase a 30-barrel fermenter that they delivered to their contract brewer, Back Forty Beer Co., over in Alabama. Their two beers—Belgian-style Ballistic Blonde and Flare Incident oatmeal stout—have gained plenty of traction since appearing on draft a year ago and co-owner Chip Jones said they’re finally opening their facility in Jackson metro this summer. For Chris and Carrie Case of Horseshoe Bend Brewing Co., thanks in part to the fifteen grand raised on IndieGoGo (one-third of which came from a single donor gifted the title of VIP for Life), reaching the finish line enabled them to convert a former firehouse into their remote microbrewery in Lake of the Ozarks, MO. For Beejay Olson and Gerrit Lewis, their race concluded with a healthy $40,000 payday (they “only” sought $30,000) to launch Pipeworks Brewing Co. in a small industrial space in Chicago and have been so successful they are already expanding. In a way, crossing that finish line marks the real starting point of getting your beer out there. Ratebeer.com owner Joseph Tucker, after crunching user-generated numbers from the site, determined that, “Pipeworks (became) the top brewery of the freshman class (of 2012)” thanks to 492 supporters financially rooting them on. The two most heartbreaking words anyone on Kickstarter can see are “Funding Unsuccessful.” That’s the notice that goes up once the clock runs out on a project that falls a penny short. Or, in Harlem Brewing’s case, $249,925 dollars short. A year after Kickstarter itself launched in 2009, Celeste Beatty needed a brewing system and she wanted to install it in her Harlem neighborhood in New York City. She’d already taken the leap from homebrewing to contracting Sugar Hill Golden Ale—named to commemorate her love of jazz and the neighborhood. “I didn’t realize that that was a very high goal to set,” she said (of the record largest ask) in hindsight. Incidentally, at that point in 2010, only three campaigns had reached a quarter-million dollars. Beatty’s story happily doesn’t end there. She initially had her eye on an historic building that had originally been a Yuengling outpost brewery and then the Bernheimer & Schwartz Brewery until Prohibition. But now she’ll possibly move into the former Taystee Bakery space across the street if more traditional sources of funding come through. “We’ve had Wall Street types, (venture capitalists)…people who see the big dollar sign down the road,” said Beatty. But she added, “We’ve turned down some private investors” because it’s those dollar signs and not necessarily the beer that has them salivating. To this last point, those who make online donations may get their names on a plaque or worse, some special page on a website, but owners don’t have to contend with issues of equity or ownership. Speaking of Kickstarter rewards, homebrewer David White deserves credit for the greatest reward offered to prospective backers. While a five-spot pledged to his fledgling Scooter Brewery—billed as a “gay owned and operated brewery” in San Diego—would’ve garnered a sticker reading “I helped start Scooter Brewery,” a pledge of at least $1,500 would’ve netted live lions, tigers, and bears. Formerly an exotic animal trainer for Vegas and Hollywood, White offered a guided trip from his future brewery over to an animal training facility. Although the project fell short of its $35,000 aspiration, White eventually partnered with Chris Shaw of Mo’s Universe (a pride-oriented family of restaurants) to launch Hillcrest Brewing Co. in the San Diego LGBT neighborhood for which it’s named. It’s that all-or-nothing approach that primarily seems to doom most brewery projects. In brewery-rich Portland, OR, upstart hopeful Crooked Bottle appeared to be a lock to achieve its $25,600 goal. After all, it had already accumulated $25,357. When the clock ran out, Crooked Bottle received pledges from 150 backers totaling more than most brewery projects ever get. And yet the owners somehow let the clock run out while still $243 shy. Ouch! Looking back at Kazmark’s comment regarding projects that hit the 30 percent level tend to reach 100 percent, I can find no record of anyone collecting 99 percent of the target then failing to cross the finish line successfully funded. It makes sense that creative types are drawn to the brewing industry. And it makes sense that they’re creatively raising capital to build and expand their businesses, even turning to the general public. Sometimes crowdsourcing sites like Kickstarter work and sometimes they don’t. A month after failing to reach $60,000 in backing to launch Rogness Brewing via Kickstarter, Forrest Rogness, owner of Austin Homebrew Supply, successfully met his subsequent and smaller $12,000 ask. Why does he believe people click to support such ventures? “There’s a beer culture and people want to get behind it,” he said. He believed that since he had “the support and the feedback of over 800 recipe kits from (his) homebrew store,” it behooved his customers to bankroll a conical fermenter at his upstart brewery. Another entrepreneurial brewer in Austin, Chris Orf, said, “Kickstarter seems more like charity. (Backers) give you a few bucks because (they) believe in what you do and like you. But only to a point. If I’ve got an extra $100 to donate to a brewery, I’m more likely to use it to buy beer than to just chip it in to the start-up slush fund.” It comes as no surprise that Orf is launching his own Orf Brewing Co. but not turning to crowdsourcing. “If somebody with big bucks gives to a business start-up venture, they’re gonna want a piece of it,” he said. The scene is playing out similarly across the brewing map (sans honoring mothers). In Berlin, the German crowdfunding platform StartNext.de launched two brauerei projects including Vagabund, which successfully funded its 200-litre nanobrewery. 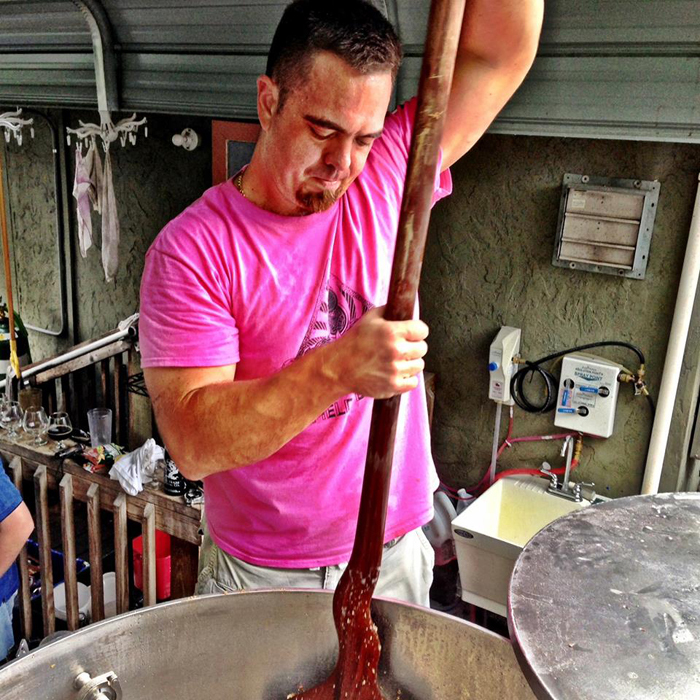 Brian Yaeger is the author of Red, White, and Brew: An American Beer Odyssey. Our first project acheieved 128%, a collaborative beer brewed between Sixpoint (US) and Invicta (BR). Take a look and let us know if we can help in any further articles. Great points in the article. This is the first I’ve seen to fully address breweries using kickstarter to fund themselves. Great article, Brian! If anyone is interested in talking to us about starting a crowdfunding campaign, feel free to email me at [email protected]. Cheers!